I often wished I had covered Wilson in the early days of the franchise, when he was a much younger man. 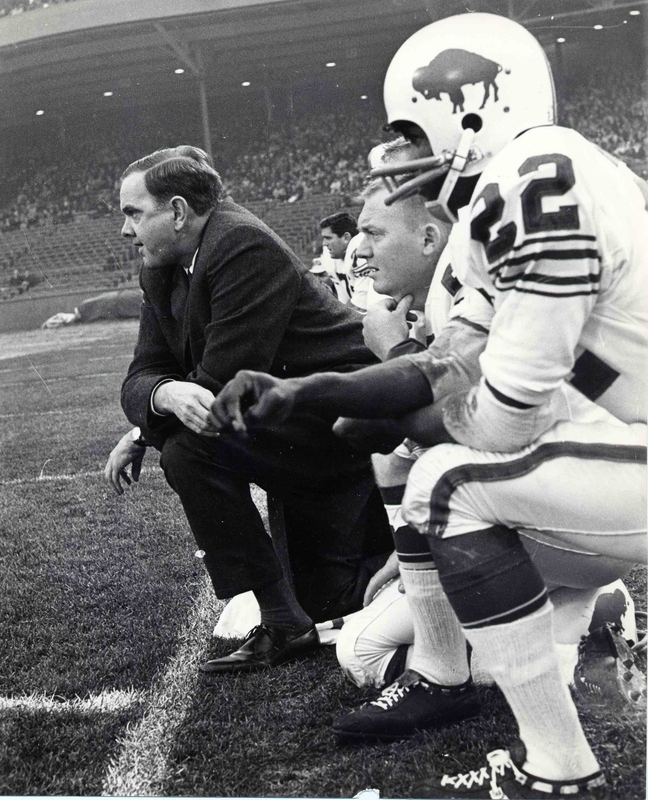 I envied the late Larry Felser, who covered the Bills from the start, when the AFL was in its infancy and pro football was just beginning to take a hold in America. It’s odd, the timing of these things. On Tuesday afternoon, I was sitting in the office, reading our stories about Jim Kelly’s cancer, how it had spread, and his wife, Jill, wanted people to pray for a miracle. Then the word came that Ralph Wilson had died. It wasn’t entirely unexpected, but in the midst of Kelly’s struggle, it arrived like a double punch to the gut. The greatest player in the history of the Buffalo Bills could be fighting for his life, and now the owner had lost his. You tend to reflect at times like this. You hug your loved ones a little more. You cry inside for people you’ve lost. In the midst of their grief, I’m sure a lot of Bills fans are wondering about the team’s long-term survival here. Fans are conflicted. I have mixed feelings about Wilson, too. It’s difficult to reconcile the Hall of Fame owner who gave Buffalo so many sporting thrills and spearheaded the AFL-NFL merger with the man whose small-minded decisions contributed to management dysfunction and a losing product on the field. Wilson’s legacy will depend on whether the team remains in Buffalo long-term. I can understand the sentiment. But Bills fans should be celebrating a Hall of Famer owner, a man who brought a team to Buffalo and kept it here, in good times and bad, for more than half a century. By the time I covered the Bills full-time, Wilson was in his 80s, a diminished version of the guy who helped found the AFL as part of the “Foolish Club.” But Felser felt Wilson shouldn’t be judged by his latter days as an owner, but for his entire career. Larry reached out to three of his friends on the selection committee, and he helped convince them to put Wilson in the Hall of Fame in 2009. At heart, Wilson was like the people who tailgated in the parking lots: a fan. He fell in love with pro football as a boy in the mid-1930s. He told me once about attending a Lions-Bears game with his father in 1934, the year the Lions moved to his hometown of Detroit. He saw Bronko Nagurski play for George Halas. It’s hard to fathom a man whose football memory reached from Nagurski and Halas to modern NFL, with its exotic defenses, instant replay and three-day draft. Wilson never lost his essential love of football. I think that’s why he resisted a public succession plan. To the end, he wanted to be the man who owned the Bills. Ralph relished being around the team, too. I have vivid memories of Wilson making the rounds of the locker room after games, going from locker to locker to congratulate the Bills and share a joke with them. “He would come in and high-five guys,” Darryl Talley said by phone from Florida. “Leonard Smith would run the length of the locker room and high-five you, damn near break your hand. The funniest thing I came remember, Ralph came in one time and I told Leonard, ‘If you hit him hard and break his hand so he can’t sign my check, I’ll kill you’. That’s how I choose to remember Ralph, as a man who loved above all to be in the company of his players. On the evening of his induction into the Hall of Fame, he sat in a party tent in Canton, greeting former players as they came up to congratulate him. They beamed like little boys. “We all loved Ralph,” said Steve Tasker, “and he felt that. He felt welcome in there and it was a special group for that reason. He was a sportsman because his dad took him to the game. It was something he shared with his father, and I think he carried that with him all his life. Covering the Super Bowl teams, soon after coming to The News, was one of the great pleasures of my career. After the Tom Donahoe years, I think Wilson was afraid to put his trust in outsiders. That’s why he turned to Levy as general manager, one of his more regrettable moves. Wilson hated being called cheap. He spent big money on players. But he didn’t like paying top price for coaches and front-office types. I felt he was suspicious of the cult of the football genius. He liked to get involved, often to his detriment. He felt he knew the game. He made his daughter, Linda, a scout, and she did pretty well. “The coach that’s a football genius is the one who won last Sunday,” Levy said. “I felt he felt that way, too. He was level-headed to work with. He’d wear his emotions on his sleeve quite often when he talked with you. “It was a gutty move to bring a coach back at the age of 61, though I lied about my age. I said I was 58. I had been fired by the Chiefs. He knew me fairly well from league meetings. It just goes to show you how smart he was. I’m grateful to him, very grateful to him for redeeming my career. Wilson gave abundantly to charities. He was generally quiet about it. He liked the small causes, the underdogs. He was one of the few NFL owners who got behind the Buoniconti initiative for spinal injuries, and it might have saved the life of Kevin Everett, one of his players. The players from the Super Bowl teams talk about the powerful bond within the team, and between the team and the town. They say it started with Wilson, who made them feel like a family. They fought and complained, like any family, but they stayed close. I hope Buffalo fans celebrate Wilson as a titan of pro football. I don’t know what will happen now. I wish I could say Ralph had some secret plan to ensure the Bills would remain in Western New York forever. He didn’t seem to feel he owed that to Buffalo, which is why many people withhold their affection. He publicly wondered if the town was capable of supporting an NFL team over the long term. But he kept it here for 54 years, when other owners fled for those greener pastures. I’d like to think Ralph was at peace about it in the end. He made a lot of money off the Bills. But he gave Buffalo a team to be proud of, and many lasting memories.